These folks are scary good. This is the band that made me sit up and notice that klezmer was changing, becoming something of this day and age. Periodically, as on the stunningly beautiful Romanian Fantasy, or even on the more straightforward bulgars that follow, the band reminds the listener that they know from traditional klez--how to play it, and how to give it life. But starting off the album with the rocking "Man in a Hat" (Canada's wonderful Moxy Früvous join in on this one!) the Klezmatics push and redefine Klez, as well. What's also interesting is how much this is absolutely, unequivocably a klezmer album, as opposed to, say, band member Frank London's soundtrack for the movie, The Shvitz, which is klez-based, but, to my ears, no longer klez. Another thing I like is how they keep switching off with the Flying Bulgars of Toronto as "coolest, beyond traditional klezmer band." The winner? Well, for now, this takes the Flying Bulgar's "Agada" and raises the ante, just as Agada built on "Rhythm + Jews." But either band in concert is phenomenal. [Whew! As I write this, their "Doina" on this new album is sending shivers up my spine. It's well, maybe a meta-doina? Doina as Nicky Hopkins might have played it if he had the patience to play slow and let the silence dance with the notes? And then, suddenly, with a shout, "Freyt Aykh, Yidlekh," [Get Happy, Jews] it's back to more traditional sounds for a bit. Celia Dropkin (1888 - 1956), pioneer of the Yiddish in zikh (introspective) poetry movement. The Klezmatics' CD "Jews With Horns" is wonderful. I don't know if it's officially released yet, but the group was selling it at a recent concert I attended at S.U.N.Y. Purchase. Once again, The Klezmatics demonstrate their skill at writing creative klezmer melodies without losing that feeling of homage to the roots of it all. If you like the Klezmatics (what a question! 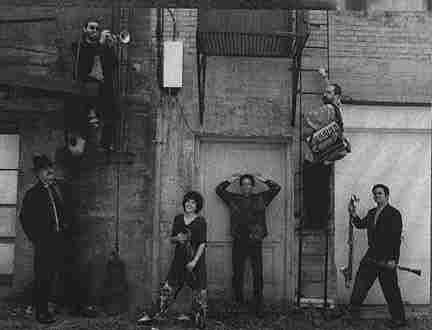 ), you will probably also want to check out Klezmer 1993--NYC (Knitting Factory Works, 1993). Subtitled, "the tradition continues on the lower east side," this is one of the most marvellous, high energy, klezmer and beyond albums I have ever heard. Needless to say, the Klezmatics, and members of the band in various other configurations, form the core of the festival. Ari Bob sez, "check it out." The Klezmatics' first two albums were on the German label, Piranha. Both are now distributed in the United States by Rounder Records (actually, Rounder distributing Flying Fish). As close to traditional as the Klezmatics came. But the first or second recording of "Alle Brider/Alle Shvester" I ever heard, and some very fun licks with Les Miserables Brass Band, including a song called "Schneider-Zwiefacher" that I later heard in another version on a recording by a marching band from what was then Yugoslavia. Lovely. The new release from the Klezmatics, (Rhythm+Jews) on Germany's Piranha label, out for several months somewhere, and only now reaching Bay Area is by far the most intriguing and musically wonderful album I have heard this year. I don't know how to get copies (other than writing to Germany), or hoping that local stores keep it in stock, but this is "next generation klez." I love it. Play it side by side with the more experimental new release by the Bay Area's own New Klezmer Trio (Masks and Faces). These bands represent a new, and very exciting fusion of Klez with world music. To me, it's the next step in reclaiming Klezmer music--moving forward with the tradition and integrating the music with today's variety of sounds and rhythms.